GGFL is delighted to announce that Josh Engel is our firm’s new managing partner. He is taking over from Deborah Bourchier, who has decided to leave the role to focus on working with her clients and mentoring the next generation of our firm’s leadership. Paying tribute to Deborah, Engel says his two main goals will be maintaining the relationship GGFL has with its clients and continuing to foster a caring, supportive working environment at the firm. Josh, who has been at our firm for more than 20 years, is GGFL’s third managing partner. He and Deborah were preceded by Gerry Levitz, one of GGFL’s founding partners. 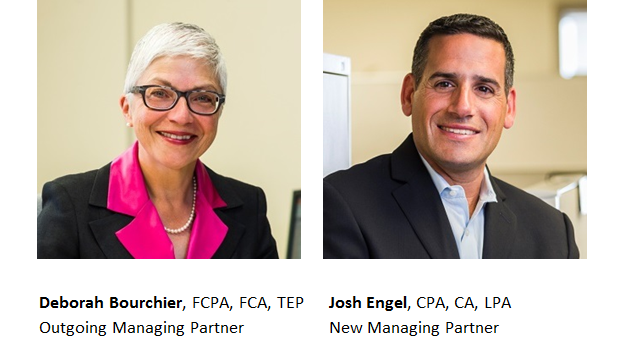 Deborah Bourchier passed the baton to GGFL’s third Managing Partner, Josh Engel, making way for our fourth generation. GGFL begins a new era and is delighted to announce Josh Engel as its new Managing Partner.